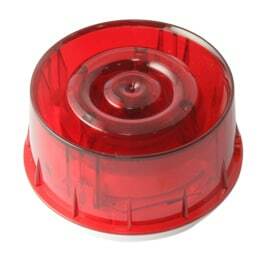 Wall mounting, addressable, loop powered sounder EN54-3 approved with RED beacon, RED, with built in loop isolation. Featuring fast and simple installation and control the Opal wall mount souder/beacon is powered by the fire panel via the loop wiring. Control of the devices is enabled using on-board switches or via the Opal digital protocol using the control panel. The range is installed simply by a twist fit onto the B501AP base. This product is not approved to EN54-23 (Visual Alarm Device) and must not be used as a visual alarm device to provide a primary warning notification of fire.